Scott Eansor achieved one goal this summer, and if he continues his upward trajectory with the Seattle Thunderbirds, he could reach another before New Year’s Day. Eansor was one of four former Colorado Thunderbirds players that participated in the U.S. National Junior Evaluation Camp at Lake Placid, N.Y., in early August, and he acquitted himself well, scoring two goals and adding two assists in three games. Eansor’s skill set and progression in the Western Hockey League (WHL) makes him an attractive prospect for Team USA for the World Junior Championship, which begins right after Christmas in Helsinki, Finland. Eansor, an Englewood product, posted 14 goals and 37 points in 72 games in Seattle last season after debuting with 12 points in 52 games during the 2013-14 season. He has thrived in big games, racking up five goals in six playoff games in 2015 and four in nine games the year before. His reliability in all three zones has made him even more valuable than his stats might indicate, said Seattle coach Steve Konowalchuk, a Salt Lake City native who began his coaching career with the Colorado Avalanche. 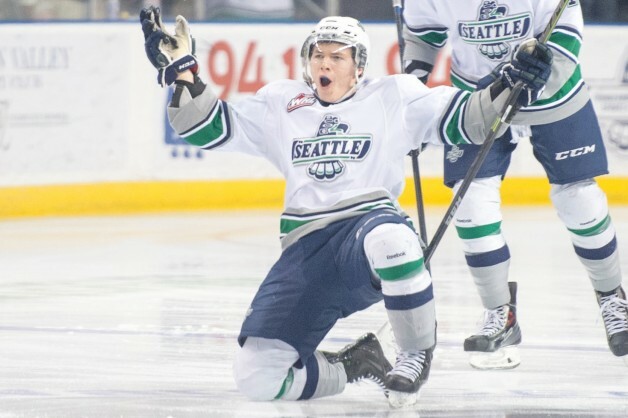 The 19-year-old Eansor, who goes 5-foot-9 and 175 pounds, plays on Seattle’s top penalty kill and sees time on the power play as well – an extension of what he contributed as a player growing up in Colorado, said Thunderbirds director of hockey operations Angelo Ricci. That is part nature and part nurture. As much as Eansor relished wearing it, there won’t be a problem with the glare of a red, white and blue jersey. The other three have been selected in the NHL Entry Draft – Carlo in the second round by the Boston Bruins in June, Turgeon in the third round by the Detroit Red Wings in 2014 and Olofsson in the fourth round by the Chicago Blackhawks in 2014. Undrafted, Eansor went to Toronto recently for the Maple Leafs rookie camp. Konowalchuk, who played 14 seasons in the NHL – including his final two with the Avalanche – said Eansor has a chance to play professional hockey if he continues to improve and progress each season.